Become a Bat Advocate and join our email network. • HIbernating bat ranges and the disease's spread. 2011 Conservation article: "Economic Importance of Bats in Agriculture,"Boyles et al. 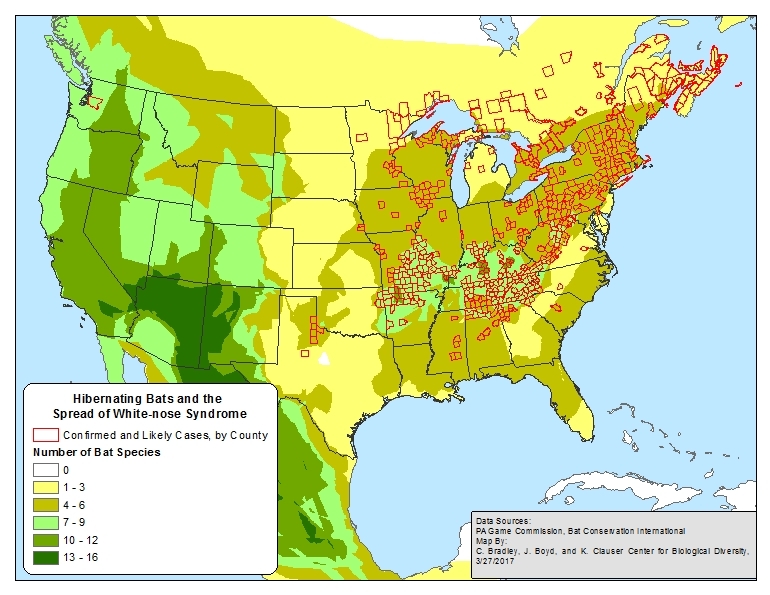 2010 Science article: "An Emerging Disease Causes Regional Population Collapse of a Common North American Bat Species," Winifred F. Frick et al. A fast-moving disease is killing bats across North America, and we need your help to stop it. White-nose syndrome has killed millions of bats since it was first discovered in the northeastern United States in 2006. Biologists consider it the worst wildlife disease outbreak ever in North America. It not only threatens to drive some bat species extinct but could also cause significant insect pest problems for agriculture and the timber industry. Every year bats provide billions of dollars worth of free pest-control services by eating tons of insects that attack crops and trees. Without bats, farmers and foresters may choose to apply greater quantities of pesticides, which is both costlier for them and harmful to the environment. In less than a decade, the previously unknown fungal disease dubbed white-nose syndrome — for the characteristic white fuzz it causes on bats' noses and wings — has spread from coast to coast, and is killing bats in 28 U.S. states and five Canadian provinces. Seven species have proven susceptible to the disease, thus far. Some species are on a dangerous path to extinction, as the disease combined with other threats may overwhelm their ability to recovery. Affected bat colonies have declined by as much as 99 percent or greater. 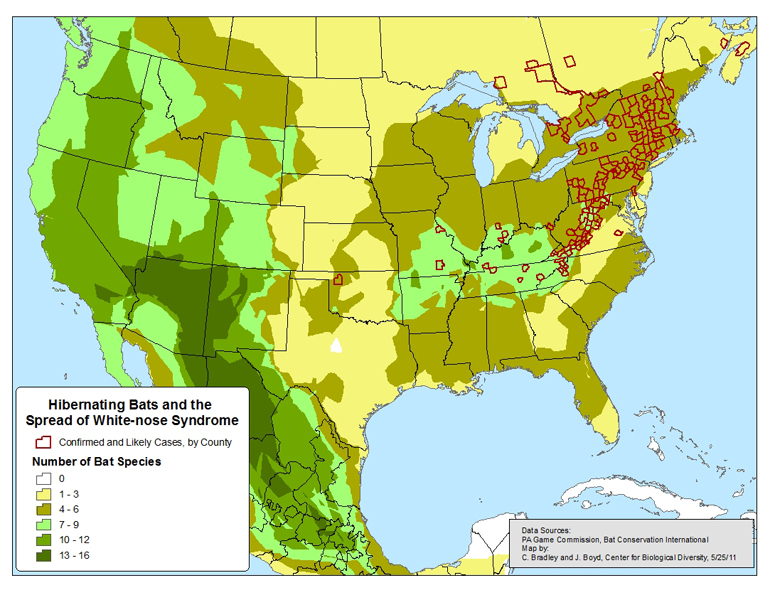 In parts of the Northeast where white-nose syndrome has been present the longest, some species, such as the once-common little brown bat, are virtually gone. Scientists predict the federally listed Indiana bat will decline to less than 14 percent of its pre-white-nose syndrome numbers by 2022. The disease strikes bats during hibernation, when their immune systems are shut down, and when they must survive on limited fat reserves for five to six months. Infected bats arouse more frequently from their torpor, burning off fat at a much higher rate. They may also suffer from severe dehydration and electrolyte imbalances. Possible treatments to combat white-nose syndrome range from anti-fungal agents to vaccines, but field trials have yet to get underway. Widespread application of any treatment is years away. Meanwhile, with their low reproductive rate and limited ability to rebound from a population crash, bats face a gauntlet of other threats that could wipe out the few survivors. These threats include industrial wind-energy projects, habitat loss to logging, oil and gas extraction and mining, and environmental toxins. There is important work to do to ensure bats have a chance to survive the catastrophe of white-nose syndrome and the plethora of other hazards that might finish them off. Among numerous actions to protect bats, the Center for Biological Diversity petitioned to protect the hard-hit northern long-eared bat and rare eastern small-footed bat under the Endangered Species Act in 2010. Since then we have fought persistently to gain these bats and other species the protection they require. Although its exact origins are unclear, there's strong evidence that white-nose syndrome was originally transported from Europe, where the fungus exists but does not kill bats. This discovery was made after the outbreak of white-nose syndrome in North America. After the white-nose fungus was found in Europe, researchers also identified it in several parts of China. No bats there appear to suffer ill effects either, suggesting that the fungus has been endemic to Europe and at least parts of Asia for a very long time. White-nose syndrome was first discovered in North America in a cave complex frequently visited by people in upstate New York in February 2006. Bats don't naturally travel between Europe and North America, and the most parsimonious explanation for the appearance of the bat-killing fungus is that it was transported on gear, clothing or footwear of a cave visitor, travelling between continents. Research on the fungus indicates it can survive indefinitely in caves and other locations, and can even grow, albeit slowly, in a diversity of substrates with minimal organic matter and in the absence of bats. Thus, infected caves and mines in North America may be permanent sources of contamination, from which bats or people can transfer fungal material to as-yet unaffected sites. The environmental resilience of the white-nose fungus may also prevent future recolonization by bats of affected hibernation sites. The potential for human transfer of the white-nose fungus, and the need to do everything possible to reduce the risk of this form of disease spread, has been a major focus of the Center's work on the white-nose syndrome issue. In March 2016 the discovery of white-nose syndrome in western Washington — a jump of 1,300 miles from the next closest location — dashed hopes of keeping the bat malady out of the West. The origins of this new disease epicenter are likely a human-assisted transmission, so it remains vital that people do all they can not to hasten the spread of white-nose syndrome around the West any further. We need to give bats a better chance of holding on until scientists develop an effective treatment. The Center has taken crucial steps to stem the spread of this deadly disease and gain protection for affected bat species. We have taken action to compel stricter rules on cave recreation on public lands; advocated for federal protection of several species affected by white-nose syndrome; and intervened in habitat-harming projects such as strip mining, oil and gas drilling, pipeline construction, and other proposals that would further threaten at-risk bats. It's vital that we curtail the spread of this disease and take every step possible to save millions more bats from death and the cumulative impacts of habitat destruction. We need your help. You can start today — join the Center's Save Our Bats campaign by signing in at the top of this page, write a letter to the editor of your local newspaper, and/or like our Facebook page and share it with your friends and family.